If you own a dog, especially a senior or small breed dog, you have likely noticed that your dog doesn't always have the freshest breath. February was Dental Health Month so to honor that, I wanted to give you some advice in the form of 5 ways you can help freshen your dog's mouth. I have 4 small breed dogs so trust me, I know it may seem like a chore but even if you just use a finger brush to swipe some dog toothpaste anywhere in your pooch's mouth, it's better than not doing anything at all. Obviously dogs can't brush their own teeth so they rely on us to help them out. Choose a toothpaste that helps fight plaque and tartar. They even have chicken flavored toothpaste. If you can't use a toothbrush then use a finger brush or even your bare finger if your dog will allow and they have a small mouth like mine do. Try to get in the habit of doing this at least once a week. Occasionally, your vet may tell you that your dogs teeth really need a professional cleaning and their may even be some teeth that need removed. This is especially common with small breeds. All of my dogs have had their teeth cleaned at least twice in their life time. They are put completely under for this procedure and it's a great way to ensure that rotten teeth can be removed, abscesses can be found and the tooth taken out, and your vet can scrape the plaque and tartar of your dog's teeth. Heart health and dental health are closely linked and since small breeds have issues with both it's well worth it for me to have it done regularly for my dogs. These cleanings can be a couple hundred dollars but I make sure to save up some money that I set aside specifically for veterinary expenses for my wolfpack. 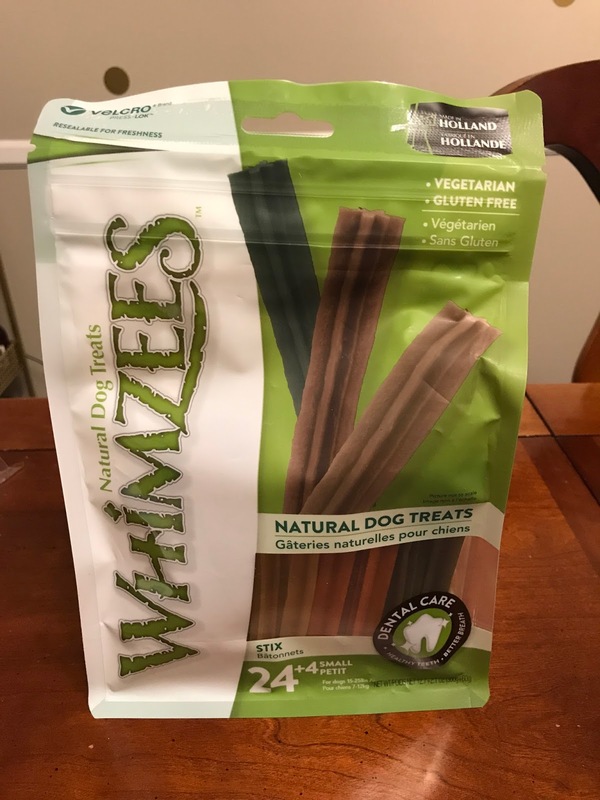 Whimzees Dental Stix from Chewy are a big hit in my household. Dental chews help "brush" your dog's teeth with their fun shape. They are completely edible and easily digestible. When you look for a dental chew, all natural ingredients is the way to go. These chews specifically are free of gluten so it's great for dogs with sensitivities. They help freshen breath and remove buildup on the teeth. IN addition to brushing I like to give these on a weekly basis. How do they work exactly? Well, their knobby shape helps ensure proper blood flow through the gums and the hollow parts allow the teeth to grip and chew. They're also easy for small dogs to hold. They aren't recommended for dogs under 5 lbs but all mine are over that and I closely monitor them anyways. 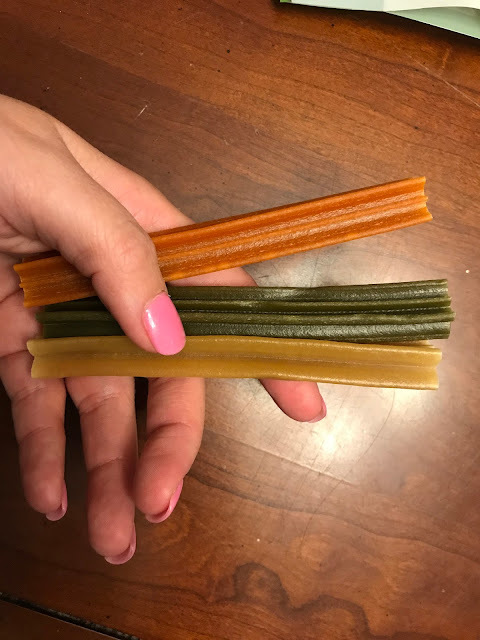 Some people think that wet food is a better option for dogs that have had to have a few teeth removed but ironically, the dry kibble is actually helpful in removing plaque just like dental chews are. So even though some of my dogs eat wet food I always mix dry kibble in with it. Sometimes people complain that the dry kibble is just too hard for their dog but you can easily soften it just a bit by mixing a small amount of water in with their food. My dogs have teeny tiny teeth and they do just fine. Obviously feeding a food that has natural ingredients is very important so that your dog is getting proper nutrients rather than "junk food". I've also noticed that my dogs have fresher breath when they eat a high quality brand of food. I always make sure that any baked goods my dogs get as treats don't contain sugar and icky ingredients like that as I know that kind of stuff isn't good AT ALL for teeth whether you're a human or a dog. These are just a few little things that can help the overall state of your dog's oral health and hygiene. Does your dog have bad breath? How do you deal? My dogs love those Whimzers. We get them to dinosaurs ones. oh really? I'll have to look for those! !